La dolce vita! Except life is anything but sweet for Jan (Kai Wiesinger), whose attempts to modernize an old luxury hotel in Italy are thwarted by the local competition’s mafia-like methods. Fortunately, help is at hand in the shapely form of Maria (Liane Forestieri), a German-Italian who originally came to fetch her young son. Together, they get the job done and, this being a romantic comedy, fall in love just as marketing director Susanne, who also happens to be Jans’ girlfriend, arrives to inspect the work. Her suspicions are soon aroused. 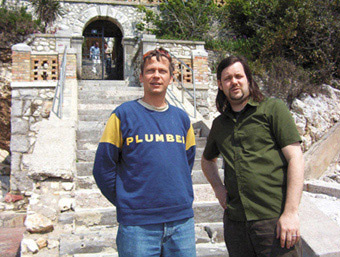 Seven Weeks in Italy is the first production from Kaminiski/Stiehm Film, formed in January 2003 by former DoRo Fiction Film managing directors Frank Kaminski and Ulrich Stiehm. Their previous credits include five theatrical features and TV movies, including such films as Baby (2002, director Philipp Stoelzl) which had its international premiere at San Sebastian in 2002 and featured in the German Cinema section at the 2003 Berlinale, as well as the death-row drama Against All Evidence (2002, director Sherry Hormann, for commercial broadcaster SAT.1,). Seven Weeks in Italy is, in fact, the team’s third film for SAT.1. It is also the first feature script from former documentary filmmaker Sebastian Schubert and marks the latest directorial outing for Klaus Knoesel. He is perhaps best known for his Rave Macbeth (2001), the youth-oriented techno update of Shakespeare’s classic tragedy. ”We are developing and producing high-quality films,” says Kaminiski, ”using experienced old-hands and also promoting young talent.” Young talent which, says Stiehm, ”we’ve mined from music videos and commercials.” They mean, among others, Philipp Stoelzl who has directed videos for Madonna, Garbage and Rammstein and is slated to helm the upcoming The True Story of Hansel and Gretel. Production is planned for 2004. The other Kaminski/Stiehm project in pre-production for 2004-2005 is the horror-comedy Natas Emmok - Come, Satan (Natas Emmok - Satan komme). Before then, however, German cinemagoers will get to enjoy their production of the teen comedy, Meet Your Star (Triff deinen Star, director Simon X. Rost), which has been picked up for national distribution by ottfilm.